The Adventures of Super Mario Bros. 3 was the second Mario television cartoon produced by DiC Entertainment, based upon Super Mario Bros. 3. Aired Saturday mornings on NBC alongside Captain N: The Game Master, the show served as a bit of a turning point to the DiC cartoon trilogy, where unlike The Super Mario Bros. Super Show! before it, the Mushroom Kingdom is shown in a more peaceful state, there is no live-action segment at the beginning and end of the episode and King Koopa does not use alter egos or employ any of Wart's minions. Numerous enemies from Super Mario Bros. 3 carry over into this series, such as the Koopa Kids, who are portrayed with solid personalities, and original names to reflect them. The series has been released on DVD by Shout! Factory and MRA Entertainment, also responsible for the DVD releases of the Super Mario World cartoon series. Unlike The Super Mario Bros. Super Show!, which was broadcast weekdays in syndication, The Adventures of Super Mario Bros. 3 was aired on Saturday mornings on NBC, alongside Captain N: The Game Master for the 1990-1991 season. The two shows originally aired in a one-hour package entitled Captain N & The Adventures of Super Mario Bros. 3, which consisted of a half-hour episode of Captain N: The Game Master sandwiched between two fifteen-minute Mario episodes. The two shows were then split up for later airings. 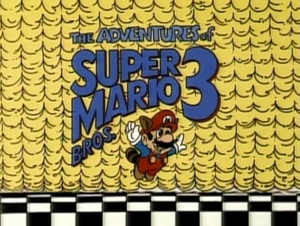 The Adventures of Super Mario Bros. 3 was the only animated Mario series to use episode title cards and also the only one to open with a narration instead of a theme song. 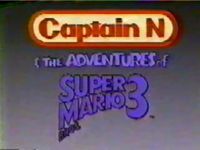 Title card for Captain N & The Adventures of Super Mario Bros. 3. While The Super Mario Bros. Super Show! mainly dealt with Mario and Luigi helping Princess Toadstool and Toad trying to stop King Koopa from taking over the Mushroom Kingdom and other lands, The Adventures of Super Mario Bros. 3 took place some time later, after the events of the game, when the Mushroom Kingdom was in a more peaceful state. Luigi, Toad, Mario and Princess Toadstool. As it was based on Super Mario Bros. 3, the feel of the Mushroom Kingdom changed to better resemble the game. The various worlds of Super Mario Bros. 3 were visited regularly, and new Power-Ups such as Super Leaves and Frog Suits appeared. King Koopa also changed his army, losing Wart's minions, but gaining more of his own, including Boom Booms, Boomerang Brothers, Sledge Brothers, Dry Bones, and many more. Also, King Koopa no longer goes through various alter-egos and wears costumes, although characters continued to call him King Koopa like they did on the Super Show, his full name, Bowser Koopa, was mentioned in a few episodes. Furthermore, none of the voice cast from the Super Show returned to their roles, except Harvey Atkin and John Stocker. One notable addition to the cast was Bowser's seven Koopa Kids, who were given alternate names for the show. Although DiC has never properly explained why different names were issued for the Koopalings, they hadn't been named by Nintendo of America when the show began production. Because they needed names for the characters, the writers had to make up names of their own. The Koopa Kids. Back row from left to right: Hop, Kootie Pie, and Hip. Front row: Bully, Big Mouth, Cheatsy, and Kooky. Other locations in the show included Toad's House and the Mushroom Castle, where the protagonists often reside between their adventures. The Koopa family took up residence at Kastle Koopa, located in the heart of Dark Land. In many episodes, the Koopas would use their Doomship to launch their attacks. The Mushroom Kingdom was finally free of King Koopa's tumultuous troublemaking. Mario and Luigi had chased the rascally reptile into a Banishment Zone and sealed the entrance with ten-thousand bricks. Then, after posing for hero statues and being feted with a kingdom-wide gourmet victory feast, our brave plumbers returned home to Brooklyn. But when the peaceful Mushroom People least expected it, King Koopa escaped. Vowing to finally get his villainy right this time, Koopa blasted back to the Mushroom Kingdom in his flying battlewagon, the Doomship, and revealed the wildest, weirdest, wackiest danger any Nintendo world has ever faced: King Koopa's kids. Bully Koopa, Big Mouth Koopa Jr., Kooky von Koopa, Cheatsy Koopa, Kootie Pie Koopa, and the last of the litter, twins Hip and Hop. Now, it was Koopa plus seven Koopa Kids, and the peaceful Mushroom Kingdom faced seven-hundred times the pandemonium. Princess Toadstool sent an urgent call for help. Only the Super Mario Bros. could stop the royal Koopa and his obnoxious offspring from wreaking their half-baked havoc. And Super Mario 3,[sic] the Super Marios' super mirthful adventures had begun. Our stories can start in several ways. First, they can begin with our heroes and heroine: Mario, Luigi, Princess Toadstool and Toad. I.e. they set out to rescue a troubled Mushroom Kingdom citizen, or on a personal quest, and then quickly find their lives complicated by King Koopa and his kids. Or, we can start our stories at Kastle Koopa, when King Koopa announces his latest wicked and wacky scheme, then selects which one of his Koopa Kids he'll take along as his assistant. Depending on the specific evil talent required for the Koopa caper, à la Mission Impossible. And then it's up to our heroes to stop them. Since there's never been a more rivalrous group of siblings, the Koopa Kids clamor to win King Koopa's favor, and sabatoge one another in order to be chosen. When the riot ends, King Koopa and the kid, or kids of his choice, set out to create havoc in all the rich, new levels of the Mushroom Kingdom. From Grass Land to Desert Hill, Water Land to Giant Land, Sky Land to Ice Land, and Pipe Land to Dark Land. And it's not just the good folk of the Mushroom Kingdom who are in danger. Loading up his giant, flying battlecraft, the Doomship with Koopa Troopas and Paragoombas, King Koopa and his off-the-wall offspring even mount occasional surprise assaults on the un-Mushroom Kingdoms of the Real World's New York City, Hollywood, Fort Knox, London, Paris, or Hong Kong. If that isn't trouble enough, the Koopa Krew has a whole new assortment of malicious and madcap minions to help them harass our heroes and heroine. Boo Diddleys, pesky ghost heads with big teeth and short tempers. Thwomp, a monumental hunk of menacing rock with the ambition to be Mario's tombstone. Ptooies, mouth-headed mercenaries who spit spiked cannonballs. And Rocky Wrench, a sneaky turtle with severe overbite who hides in manholes and ambushes unsuspecting plumbers. In every corner of this colorful land, we find appealing three-dimensional personalities, who truly deserve a Mario Bros. rescue. No matter how much we want to laugh at the comedic appearances of our Nintendoish cast, they come complete with hearts, minds, dreams, feelings, and all the indentifiable human conflicts essential to rich storytelling. DiC chairman Andy Heyward served as the series' executive producer, with John Grusd serving as the producer and director. Production was supervised by Brian Miller, the scripts by Lori Crawford, and development of the series for television was done by Bruce and Reed Shelly. The art was directed by Frank Ridgeway, and the animation supervised by Julian Fries. Characters original to the series were designed by Paul Wee, Fred Carrillo, Sandy Kopitopulos, and Phil Weinstein. Music for the series was supervised by Joanne Miller and composed by Michael Tavara. Overseas animation was provided by Sei Young Animation Co., Ltd. of South Korea. The series was coproduced with Reteitalia S.p.A.
All character voice actors and actresses for The Adventures of Super Mario Bros. 3 were based in Canada, directed by Greg Morton, and cast by Paul F. Quinn. The main voice actors included Walker Boone as Mario, Tony Rosato as Luigi, Tracy Moore as Toadstool, and John Stocker and Harvey Atkin reprising their roles as Toad and King Koopa from the previous series, respectively. Tara Strong, then known by her birth surname Charendoff, voiced Koopa's youngest children Hip and Hop, as one of the first roles in her long and prolific voice acting career. Of the other Koopa Kids, Kootie Pie was voiced by Paulina Gillis (now known as Tabitha St. Germain), Cheatsy by James Rankin, Kooky by Michael Stark, Bully by Gordon Masten, and Big Mouth by Stocker's "Zoo Factory" colleague Dan Hennessey. Additional voice actors included Morton, Bonnie Brooks, Rod Coneybeare, Diane Fabian, Catherine Gallant, Jonathan Potts, Susan Roman, Linda Sorenson, Stuart Stone, and Marlow Vella. The series' opening narration was supplied by an uncredited Ernie Anderson, who was the then-current promotional voice actor for NBC's rival network ABC. September 8, 1990 "Sneaky Lying Cheating Giant Ninja Koopas" "Reptiles in the Rose Garden"
September 15, 1990 "Mind Your Mummy Mommy, Mario" "The Beauty of Kootie"
September 22, 1990 "Princess Toadstool for President" "Never Koop a Koopa"
September 29, 1990 "Reign Storm" "Toddler Terrors of Time Travel"
October 6, 1990 "Dadzilla" "Tag Team Trouble"
October 13, 1990 "Oh, Brother!" "Misadventure of Mighty Plumber"
October 20, 1990 "A Toadally Magical Adventure" "Misadventures in Babysitting"
October 27, 1990 "Do the Koopa" "Kootie Pie Rocks"
November 3, 1990 "Mush-Rumors" "The Ugly Mermaid"
November 10, 1990 "Crimes R Us" "Life's Ruff"
November 17, 1990 "Up, Up, and a Koopa" "7 Continents for 7 Koopas"
November 24, 1990 "True Colors" "Recycled Koopa"
December 1, 1990 "The Venice Menace" "Super Koopa"
The Koopa Kids were known by different names in the series, having new names that reflected their given personalities, and some aspects of their designs deviated slightly from their game artwork. Koopa was called "Bowser" in a few episodes, and that name was used regularly in the French dub, which also used the Koopa Kids' game names. The character designs for the four heroes and Koopa were retained from the Super Show, but after "Princess Toadstool for President", Mario's hair was recolored to its present brown while Luigi's hair stays black, and Toadstool's eyes are black in this series as opposed to their original green. There is only one single Airship, which is referred to as the "Doomship", and Kuribo's Shoe is referred to as "Karoobi's Shoe". No distinction is made between standard Super Leaves and P-Wings, with all flight power being near-limitless, and the Mushroom Kingdom and Grass Land are treated as one and the same. Although the show did not carry over the Mario brothers' current shirt and overall coloration swaps from the game, the orange-and-red color motif from their NES fire sprites, where their shirts were colored like their hats but their overalls were not, was retained when it appeared in "Super Koopa". Also, Mario was portrayed with his current color scheme from the games on the Shout! Factory DVD cover, while in the show, he is still portrayed with his original color scheme. For this subject's image gallery, see Gallery:The Adventures of Super Mario Bros. 3. Portuguese (NOA) Super Mario Bros.
As Aventuras dos Irmãos Super Mario (re-dub) Super Mario Bros.
1 - The difference between the Latin American and the Spain re-dub title of the series is this: in Latin America, they are the Super "Mario" Brothers, with Super being an adjective to "Mario" which is their last name, whereas in Spain, they are the "Super Mario" Brothers, with "Super Mario" being sort of their last name. This difference is one of the minor ones between the two dubs, the Spain re-dub having kept many changes and mistakes (particularly regarding to character's names and episode titles) from the Latin American dub, as opposed to the first Spain dub, which went to their own (and more accurate) translation of the English version. During the credits, a scene of the episode "Sneaky Lying Cheating Giant Ninja Koopas" is shown, where Mario and Luigi hit a giant block. In the episode, the block quickly vanishes when the Bros. hit it. However, in the credits, the block is still there, even after being hit. The Italian dub uses an instrumental version of the intro sequence without the opening narration. This also exists on a few episodes for the Brazilian Portuguese dub. There were three different Brazilian Portuguese dubs. The first dub by Herbert Richers S.A. does not use the original background music from episodes 15 to 26, being replaced by Isao Tomita compositions. The second dub was made by BKS only to distribution in VHS format. The third dub was made by Uniarthe São Paulo that was exclusive to distribution in DVD, and Toad was renamed to "Todd". There were two different Hungarian dubs. The first dub was made only for the VHS format in the 90s, the second dub was made for the DVD release. The VHS release contains 6 episodes, the DVD contains 12 episodes. The series was never aired in hungarian TV channels, and never dubbed the complete series. This page was last edited on April 8, 2019, at 10:21.